Evil lurks in the towers and dungeons of Castle Ravenloft, and only heroes of exceptional bravery can survive the horrors within. Wizards of the Coast slaps the Dungeons & Dragons brand (and the Castle Ravenloft one too for good measure) on yet another dungeoncrawler, a genre which really has pretty much been done to death. Yet … despite the bland graphics, dearth of illustration, and recycled D&D figures (all obvious signs of corporate cost-cutting) the system is fast and snappy and well-designed enough to have made the game surprisingly popular, especially among old D&Ders who no longer have the time to play roleplaying games. This is dungeon-delving for gamers who want the kill-the-monsters fun of D&D without the big time investment. 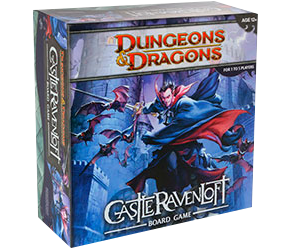 Packed with plastic miniatures (40 in all), heaps of cardstock dungeon floor tiles, lots of cards, magic items, abilities and weapons, and a wide variety of fun scenarios, Castle Ravenloft is the essence of dungeon-crawling distilled into a deep cardboard box. It’s a co-operative adventure experience for 1-5 players, and while the rules don’t have much in common with the roleplaying game past the ubiquitous 20-sided dice, it’s received unanimous praise for its streamlined rules and fun play. The most impressive thing that will greet you when you first open the box of Dungeons & Dragons: Castle Ravenloft Board Game is 40 fantastically detailed plastic miniatures. 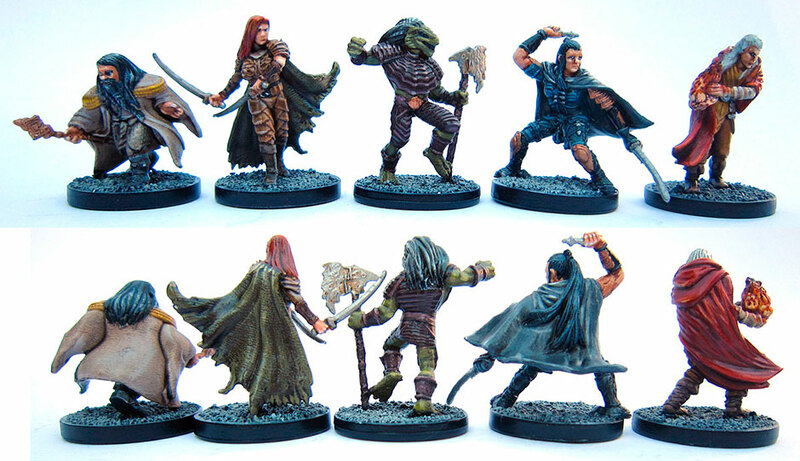 Of course you can enjoy games of Castle Ravenloft straight away, but it really comes to life when you take the time and effort to paint these figures and make them look their best. It may seem a daunting task but actually it’s quite easy to get impressive results—especially if you use this article as your guide! Now, as usual with all these painting guides, these are just my personal colour schemes, and you can paint your figures any way you like. I actually don’t enjoy coming up with original colour schemes much, so I tend to lean heavily on publisher’s painted examples or other gamers’ photos on places like BoardgameGeek for inspiration. But there’s an infinite number of ways to paint your figures, so get creative! First, the characters! Here you can, from left, the Dwarf Cleric, the Human Rogue, the Dragonborn Fighter, the Human Ranger, and the Eldarin Wizard. I’ve taken photos of the front and back of these figures so you can see everything. They’ll probably take you the longest to paint because of the different colours and detail, but as player figures you want them to have the best paint jobs anyway! I paint my base colours, wash with Games Workshop’s wonderful Devlan Mud wash (Gryphonne Sepia for flesh tones), then highlight. On to the monsters! Starting off with those evergreen favourites, the giant spiders and the rat swarms. The red markings on the spider abdomens are a bit of homage to the Australian redback spider. Mostly however, these are just base colours with a bit of drybrushing (remove most of the paint from the brush by wiping it on a paper towel, then draw the brush across the raised areas of the figure). They take no time at all to do. Kobolds have been a D&D staple since the earliest days, and here’s a few skirmishers led by a sorceror. They’re a basic brown with Chainmail armour and Blood Red tunics. Devlan Mud works well on metallic colours to make it look a little rusty and oily as well as shade it. What’s a dungeon without a few moanin’ and groanin’ undead? Three zombies and three ghouls are featured above. GW’s Rotting Flesh is the colour of choice here, wth some Graveyard Earth mixed in for the ghouls. Liberal splatterings of Red Gore complete the picture of horror! These wolves have found their way into the dungeons of Castle Ravenloft, accompanied by a werewolf. Easy drybrushing brings out the detail in the fur. Some classic skeletons, along with something new—blazing skeletons. The skeletons are Bleached Bone, highlighted with white. The blazing skeleton figures actually come in clear blue plastic, but I decided to wash the flame areas with Asurmen Blue wash, then highlight them for a ‘magical flame’ effect. Then I picked out and painted the sketon figure normally. A howling hag and three wraiths. 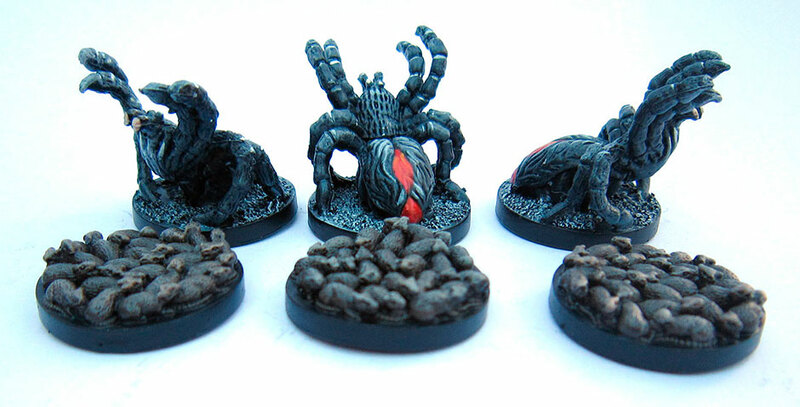 The latter I left unpainted as I liked the clear effect, but I painted the bases by stippling layers of grey on them. By the way, all the other bases have some sand stuck to them with PVA glue, which is then drybrushed from a dark grey base up to white. These stone gargoyles were easy to paint—pretty much all drybrushed in shades of grey, with some small painted white highlights. When painting red eyes, add a tiny glint of white to bring them alive! Now we’re getting to the real heavy hitters: an horrific flesh golem and a terrible zombie dragon. There’s only one of each of these figures but the photos for these (and the dracolich below) show both sides. Again, washes are your friend here to really pick out all the lovely detail. When highlighting, pick out the lower edges of gashes and stitches to make them pop (urgh!) A bit of red wash in the wounds also works well. These look complicated but actually didn’t take too long to do; you can be quite quick and ‘painterly’ in your highlighting with big figures like this, just work your way up through a few shades, getting lighter as you go. The pièce de résistance of the set: the dracolich, Gravestorm. He’s huge and ’orrible, but pretty easy to paint. I decided to make him all ‘fresh’ looking, but other painters have made his flesh all grey and ancient-looking. A base coat of Bleached Bone for the bone areas, then Dwarven Flesh on the fleshy bits. Lots of red washes did the trick here, then sharp highlights to make the fleshy bits look glossy. He’s covered with blood, so you can be sloppy with your painting! 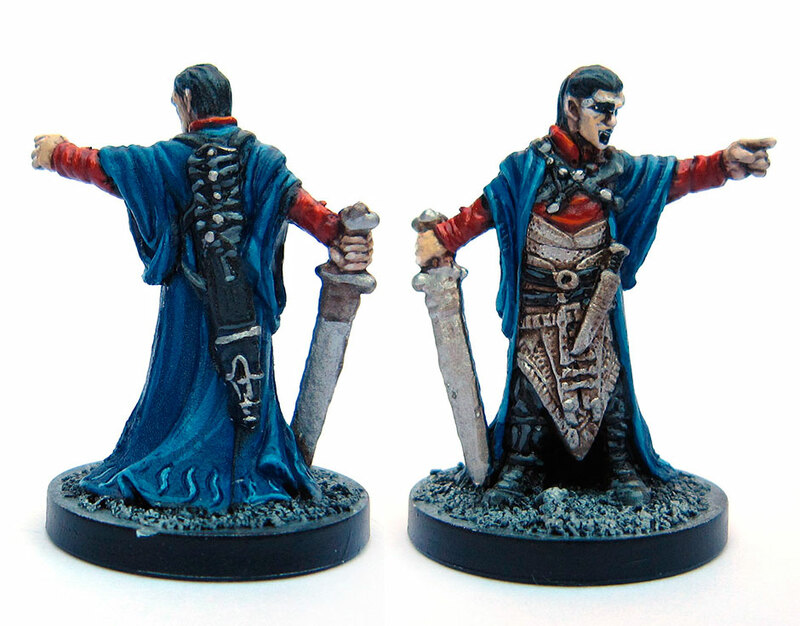 And finally here’s the Count himself, Strahd von Zarovich (shown both sides). He’s the (anti) hero of the game, so spend a little extra time on him! You make all the work sound so worthwhile! 😉 Don’t have WoA myself but if the rules are available online I’ll put it on the (quite long) list. That’s my pleasure Ben, and thank you very much indeed for the kind donation. Any plans on a foamcore insert for this? I did make one, but unfortunately – arghhh – it’s one of my games in storage and I don’t have access to it at the moment. When I get it back one day I’ll make the insert plans! That would be awesome! I’d love some inserts for all 3 D&D boxes. Any chance of also making a PDF of all three the rules summaries together (taking out duplicate rules, and giving each game’s specific rules a seperate paragraph)? That way I could perhaps print these double sided and laminate them on 1 or 2 A3 sheets. omg!! im in love with you!! just got your plans for dead of winter and descent.. gonna work on those. wanted to ask you, i see you were planning to do plans for DnD; did you? figure i ask in case i just cant find them. Thanks!!!! Thankyou chang, that’s very … errr … enthusiastic! 🙂 Sorry, this game is still in storage so I can’t post plans for it. When I get all my games out of storage – we have to sell a house and buy a house first – it will be a very exciting day on the EOG! I imagine the warehouse in which you store your games is much like the one at the end of Raiders of the Lost Ark, or possibly Warehouse 13. That’s exactly what it’s like! So… are ‘top men looking into the ark’? Sadly, until we buy a house in NZ, yes. Though I hope this sequel is better.